One of the best ways to save money on food is to make sure that you don’t waste any of the food that you do buy. In fact it is estimated that in the UK we throw away £10 billion worth of food waste every year. There are a number of ways we can stop wasting food and therefore money. Two of these ways are through freezing and finding ways to use up leftovers. Meat and fish: You can store meat and fish in a freezer for up to three months, although check the product guidelines. Wrap individual portion sizes in clingfilm or you will never prise portions apart once they are frozen. Bread: Bread is great to freeze to prevent it going mouldy before you can get through the whole loaf. It can be toasted from frozen too. Milk and cheese: Keep a spare bottle of milk in the freezer and you won’t run out again. Freezing can affect cheese’s texture, but if you will be using it for cooking this won’t matter too much. 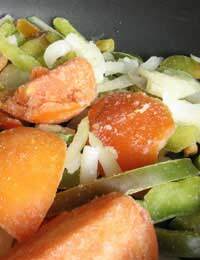 Fruit and vegetables: To freeze vegetables, blanche them and plunge into ice cold water then freeze. Fruit that has been frozen can go a bit mushy but it’s still fine for baking and cooking. Wine: Rather than opening a bottle every time you need a splash for cooking, save any leftovers in ice cube trays and just pop one into your dish when required. Herbs: When you buy herbs it can be hard to get through them all before they go off. Chop them and freeze on a flat baking tray. Then empty the frozen shards into freezer bags and use as required. Batch cook meals such as soup, stew and chilli and freeze individual portions. These will come in handy for evenings when you’re too tired to cook and the lure of the takeaway is strong. Check out supermarket reductions. Foods that are about to go off are often reduced and you could stock up and save some serious money if you have space in your freezer. Make up sandwiches and freeze them in clingfilm. This saves time and money – just take out what you need each morning. There are plenty of ways to use up leftover food. Try to always consider whether leftovers can be used in any way before you throw them away. Here are a few economical ideas. Buy a whole chicken and roast for a Sunday lunch, use leftover meat for sandwiches the next day. Use leftovers for a chicken curry, rissotto or pasta dish. Boil the chicken carcass for stock for the base of a soup. Use leftover cooked vegetables and meat to make a soup. Use leftover mashed potato for a fish pie or fish cakes. Use bananas that are on the turn in banana bread and other baking. Use stale bread for breadcrumbs – these freeze well too.